Divorced Conservatives Unite to Save the Sanctity of Marriage From Homosexuals! Freehold, Iowa - The United States Department of Faith consists of a diverse group of conservative Republican Evangelical Baptist Pastors. "Some of us are divorced, some of us are remarried, some of us are single," says board member, Pastor Deacon Fred. "But we all have one thing in common: We can't stand homos! We all believe the same Nancy boys we freely gave wedgies to in gym class, are now getting their payback by destroying America! And right now, they are attacking the very thing we hold closest to our hearts! 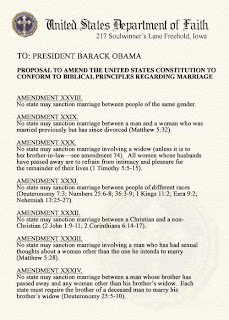 The sanctity of Christian marriage! If this was a reality TV show, or a cheap movie, it would be called, Revenge of the Homos!" 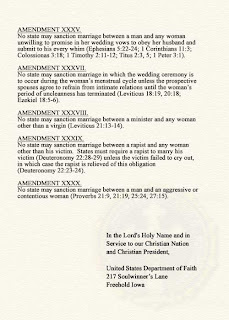 This month, the Board of Directors voted unanimously to reiterate mainstream America's stance on the sanctity of marriage by delivering to the U.S. Senate, the House of Representatives and the President of the United States, the following proposal to incorporate Biblical restrictions on marriage into our Godly nation's otherwise embarrassingly flawed Constitution.